Is Marie Osmond Lesbian ? 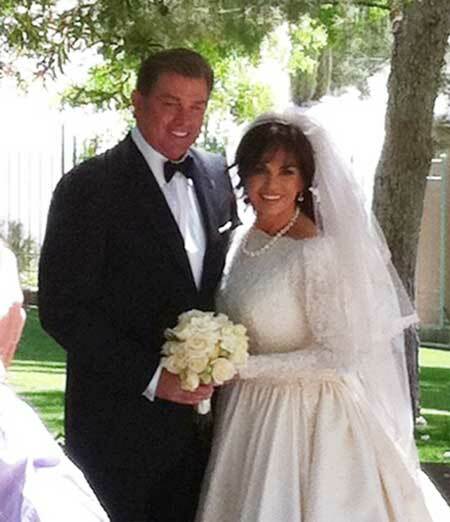 Marie Osmond, an American singer, actress, and screenwriter is currently married to Steve Craig, a designer, since 2011. She was born to mother Olive May and father George Virl Osmond. Marie made her first TV appearance at the age of three when she and her older brothers performed on The Andy Williams Show as the Osmonds. After spending the 60s as variety-show fixtures, the Osmonds shot to pop stardom in 1970 after turning to recording. Marie Osmond was born on 13 October 1959 in Ogden, Utah to the family of George Virl Osmond and Olive May. As a child, she was a member of The Church of Jesus Christ of Latter-day Saints. She herself made a debut on TV as the part of her brothers' act The Osmond Brothers on The Andy Williams Show when she was just four years of age. She came up with her fourth studio album named 'This Is The Way That I Feel in 1977. She collaborated with Dan Seals singing a duet called 'Meet Me in Montana. The song became the no.1 country hit in 1985. Some of her hit songs include I Only Wanted You, You're Still New to Me, I Only Wanted You, and Everybody's Crazy 'Bout My Baby. She started her acting career in 1976 in Donny & Marie. The show was renamed The Osmond Family Hour in 1979. She performed in the documentary series Ripley's Believe It or Not! with Jack Palance in 1985 and 1986 for two seasons. Not just acting and music, she also had a radio show called 'Marie and Friends' in 2004. Osmond has an estimated net worth of about $20 million at present. Marie has been married three times and twice with the same man. Previously, she was in a relationship with Jeff Clayton, an acting student. The couple got engaged in 1979 but soon called off the betrothal. She mentioned that it was too tough for her to make a commitment as marriage is a very crucial step. She married her first husband the Brigham Young University basketball player Stephen Lyle Craig on 26 June 1982. They welcomed their only child Stephen James Craig on 20 June 1983. Because of some personal disputes, the two divorced in 1985. The next year she married Brian Blosil at the Jordan River Temple in Utah in October 1986. The couple shares two kids Rachael Lauren (1989) and Matthew Richard (1998). Also, they adopted five more kids namely Michael Bryan, Brandon Warren, Brianna Patricia, Abigail Olive May, and Jessica Marie. Her daughter Jessica is bisexual. Osmond revealed the fact in April 2009 and mentioned that she's living with her partner in Los Angeles. The couple announced they were divorcing on 4 March 2011. In May 2011 she remarried her first husband Craig in a small ceremony in the Las Vegas Nevada Temple and wore the same dress from her first wedding. Her son Michael killed himself by jumping from the eighth floor of his apartment on 26 February 2010. Sources reported that he was in rehabilitation at the age of 12. He was battling from depression and addiction. Osmond herself suffered from postpartum depression back in 1999. Age: As of 2019, she is 59 years old. Height: She stands at a height of 5 feet 5 inches tall. Weight: 120 lbs or 54 kg. Marie Osmond got married to Steve Craig on 26 June 1982, but the couple did not continue their marriage relationship and they divorced on 4 October 1985. She got married to Brian Blosil on 28 October 1986 but the couple did not continue their marriage relationship and they divorced in 2007. She then remarried her first husband Steve Craig on May 2011.They have one child named Stephen. They have one child named, Stephen James Craig, who was born on April 20, 1983. He is the first child of this couple. Rachael Lauren is the second child who was born on August 19, 1989. There is not much information about Rachael. Matthew is the third child of Marie. There is not much information about him except a few pictures. She is the adoptive child of her named Jessica Marie born on December 17, 1987. There is no more information about her. He is the adoptive child of her named Brandon Warren born in November 1996.There is no more information about his. She is the adoptive child of her named ,Brianna Patricia who was born on November 19, 1997. He is the adoptive child of her named,Abigail Olive who was born in May b. September 5, 2002.